1. The site of this clinic is derived from 3 blocks of housing unit with double-layer height. 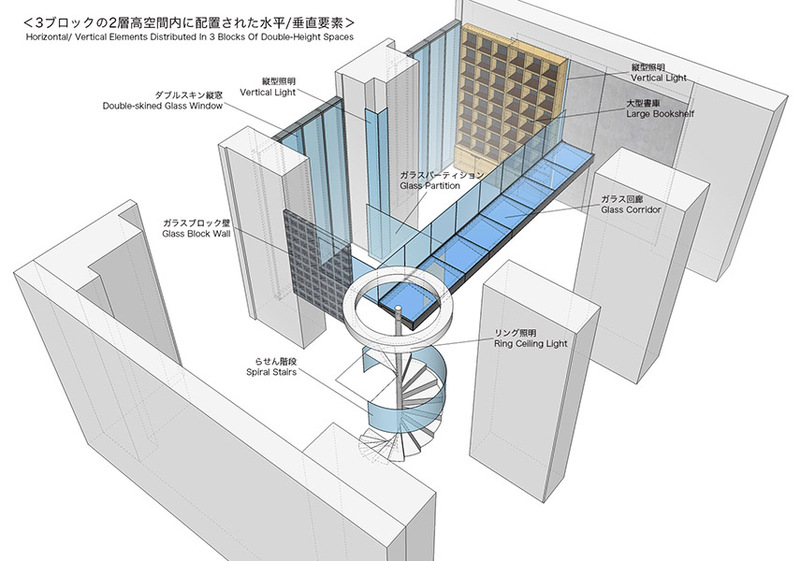 While utilizing the double-height of the space, it was necessary to unify those 3 blocks into a single space; therefore, floating glass corridor was place to link those 3 blocks horizontally, and a spiral staircase was provided to link 1st and 2nd floor levels. Various vertical elements and flat planner surfaces are distributed within the space to exaggerate the nature of this space. 2. This image represents those main horizontal/vertical spatial elements distributed within those 3 blocks of housing units with double ceiling height. Each of those elements signifying horizontality and verticality also contributes with its use of similar materials (glass/steel), degree of transparency applied to glass elements for the sense of unity/ contrast. 3. 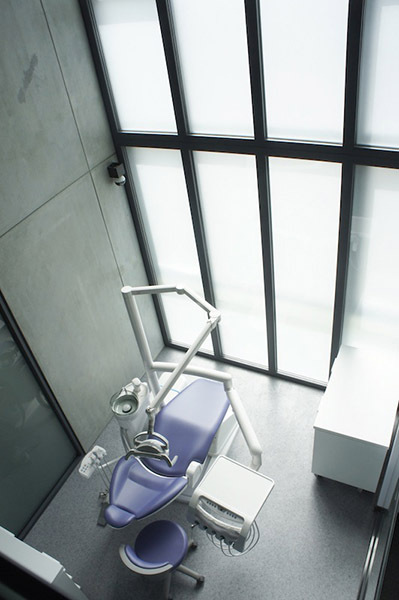 While inserting necessary programs of dental clinic in a limited space, portion of a space on the window side is provided with a double-height ceiling with airy atmosphere. 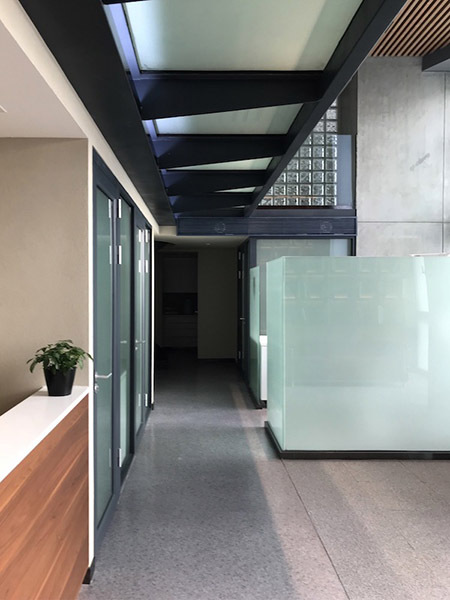 A waiting room, and a No.1 examination room with translucent glass partition is allocated in this space, where visitors to the clinic first experience the atmosphere of this space. 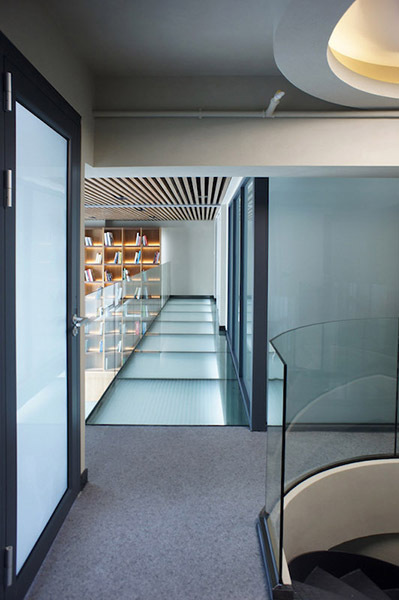 A glass corridor is placed as a circulation to go across those 3 blocks of spaces; at the same time, this glass corridor mediate the area with 2-floor area and the open ceiling area. 4. 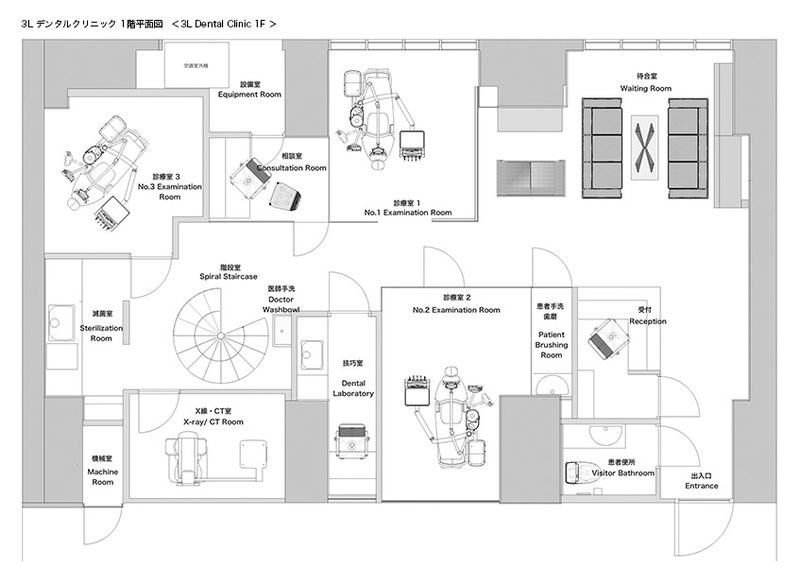 1st floor plan. 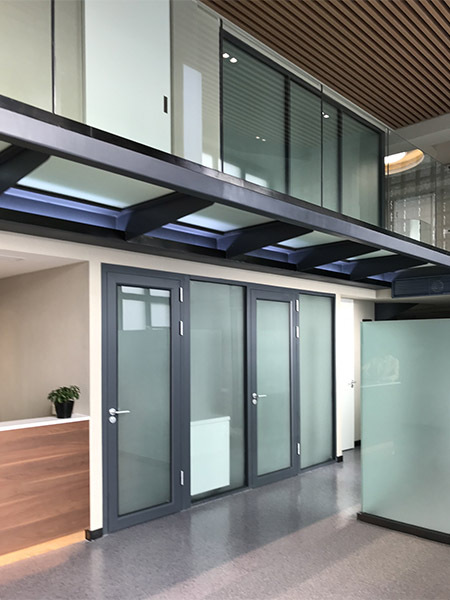 Once visitors enter into the clinic from the entrance, they go through the normal ceiling height area with Reception to the double-height ceiling area with Waiting Room. Then visitors are guided to No.1 Examination Room with translucent partition or No.2/3 Examination Room in compartments. 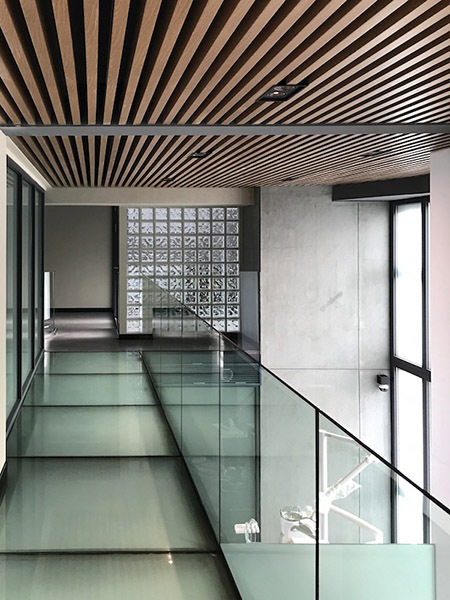 Main programs of the clinic are allocated in the furthest area of the space from the entrance, while the space is separated into the double-height ceiling space in public nature and the 2-story floor space in private nature. 5. 1st floor plan. 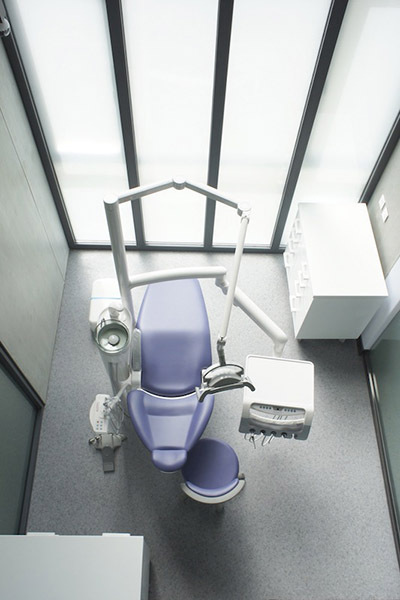 Once visitors enter into the clinic from the entrance, they go through the normal ceiling height area with Reception to the double-height ceiling area with Waiting Room. Then visitors are guided to No.1 Examination Room with translucent partition or No.2/3 Examination Room in compartments. 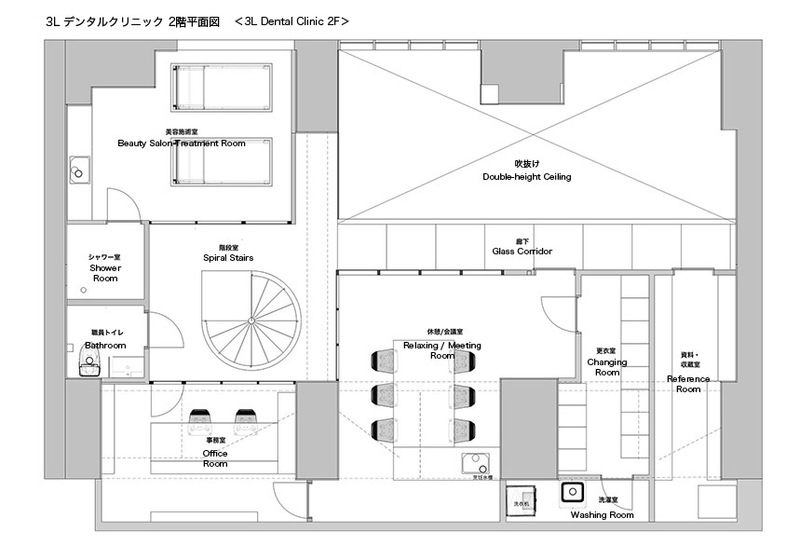 Main programs of the clinic are allocated in the furthest area of the space from the entrance, while the space is separated into the double-height ceiling space in public nature and the 2-story floor space in private nature. 6. View from the Reception/Waiting Room area. 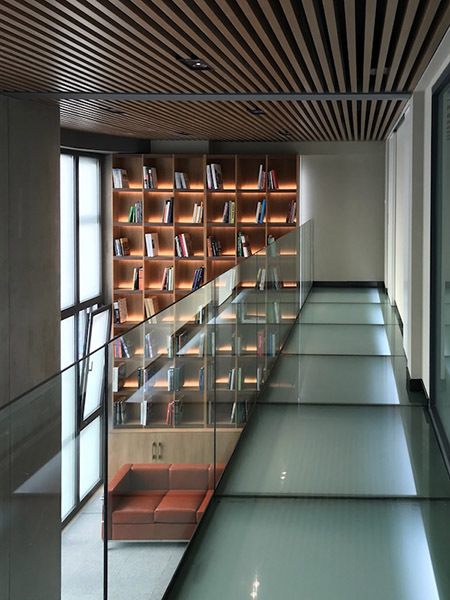 A 2nd floor Glass Corridor is floating above the 1st floor circulation, by linking those 3 blocks of spaces in horizontal orientation, as well as mediating the 2-story area and the open ceiling area. 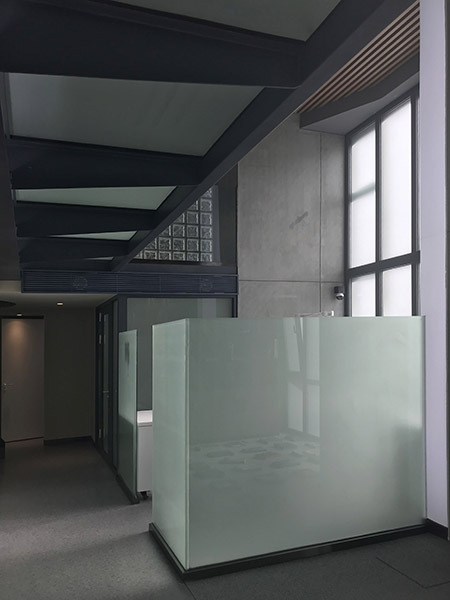 The translucent glass partition houses No.1 Examination Room. Colors, textures, weight balance of materials are the main subject of the consideration for the space. 7. View from the Waiting Room. 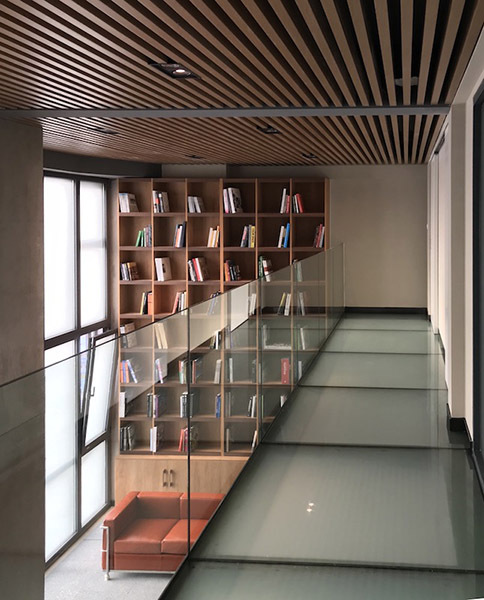 Steel frame and glass surfaces of the Glass Corridor reveal strong horizontality within the space, and lead the visual line into the main program spaces allocated further into the space. Various programs are visually indicated by varying quality of materials, textures, and colors. 8. Spatial configuration consisting of Lines and faces is clearly visualized by varying materials, their textures, and colors. 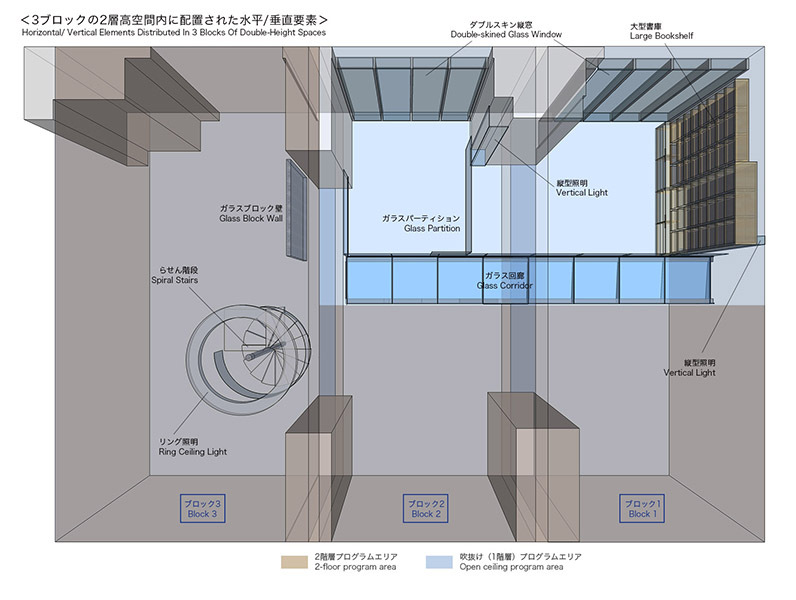 This allows to clarify various elements within the space, while it contributes to visually and spatially understand those different programs in this space. 9. No.1 Examination Room loosely divided from the double-height space by translucent glass planes. This translucent glass is also used for the other glass surfaces including the Glass Corridor to visually link those together. At the furthest right part of this photo is the Vertical Lighting Instrument to stand out within the double-height space. 10. No.1 Examination Room loosely divided by the translucent glass partition. Patients receive treatment by enjoying the airiness of the exceptional ceiling height and lightness of the space lit by daylight. 11. Image to look down No.1 Examination Room from the 2nd floor Glass Corridor. 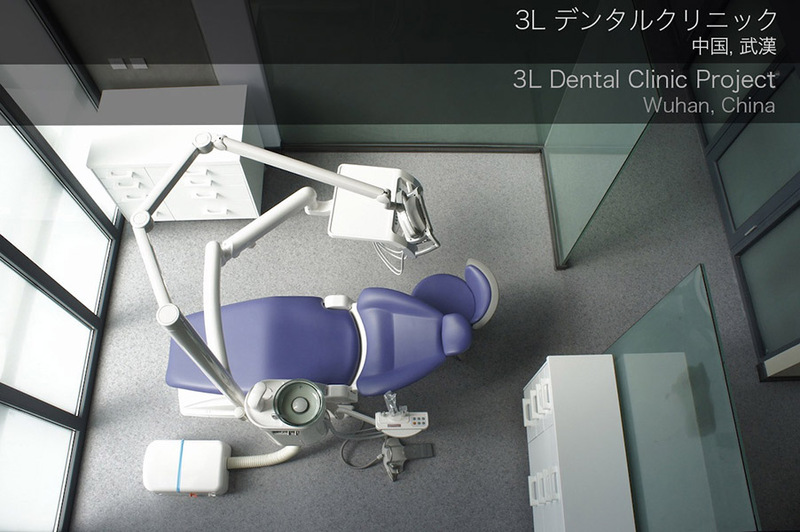 It is possible to be used for the event of dentist training sessions. 12. View from the Glass Corridor to the wall bookshelf. This clinic can be also used in various events such as home party, product introduction gathering, etc. after the operation hour of the dental clinic. The large wall bookshelf also functions as a spatial element to exaggerate the nature of the double-height space. 13. Image with various lighting instruments turned on（bookshelf, vertical lights on the right side of the bookshelf). Vertical light is also integrated with the massive column in the double-height area by utilizing its irregular shape. Night time atmosphere of the space is largely different from the daytime space. 14. Image of the wall bookshelf. 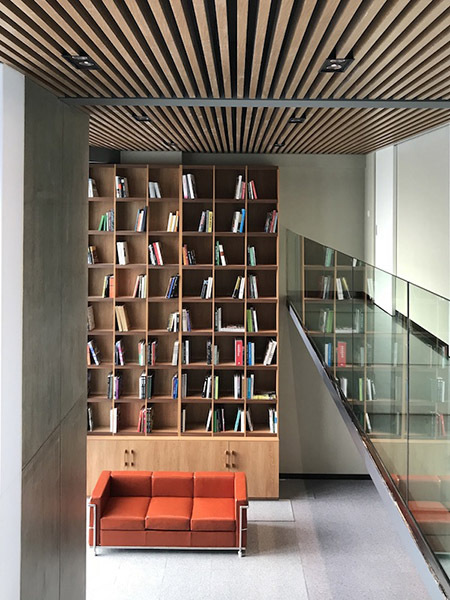 Within a space dominated by massive concrete columns, glass/steel elements, this wooden bookshelf gives contrasting texture to the space. It also contributes to the spatial configuration as a "plane" to divide a large plane of the double-height space. 15. Image to look back the Glass Corridor form the wall bookshelf side. On the opposite side of the wall bookshelf, a wall built with glass blocks is placed to be a "pair" with the grid/lattice pattern of the bookshelf. 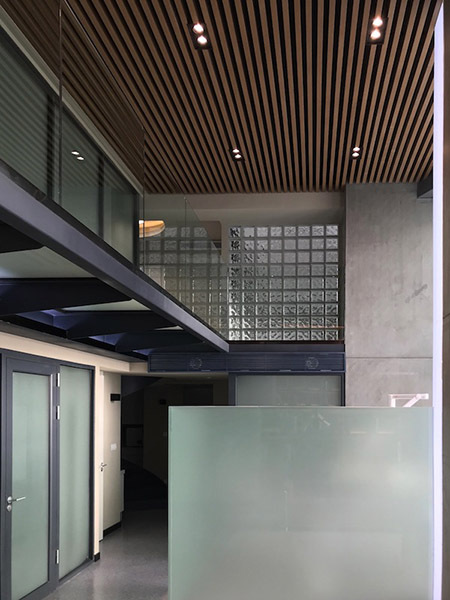 It reveals the contrast with the glass surfaces of the corridor, the linear pattern of the louvered ceiling, and the flat concrete surface of the massive column. 16. 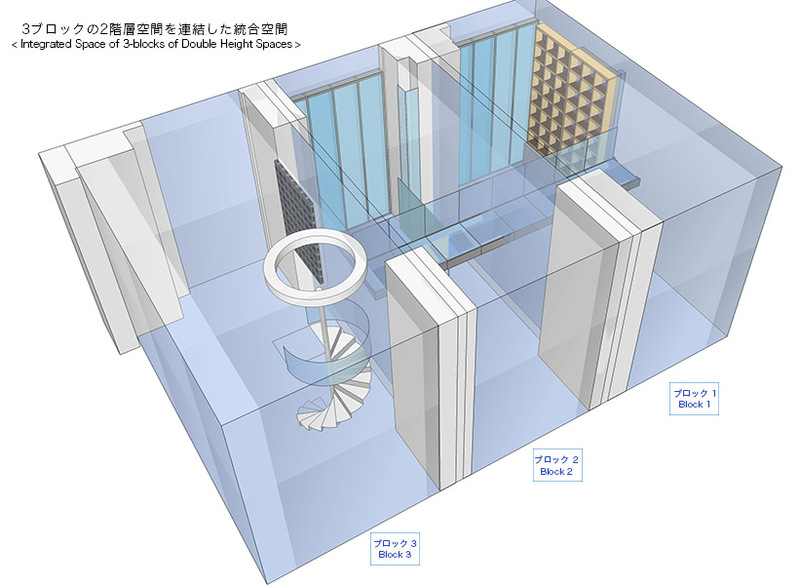 Spiral staircase is connecting the 1st and 2nd floor at the space leading to the Glass Corridor. 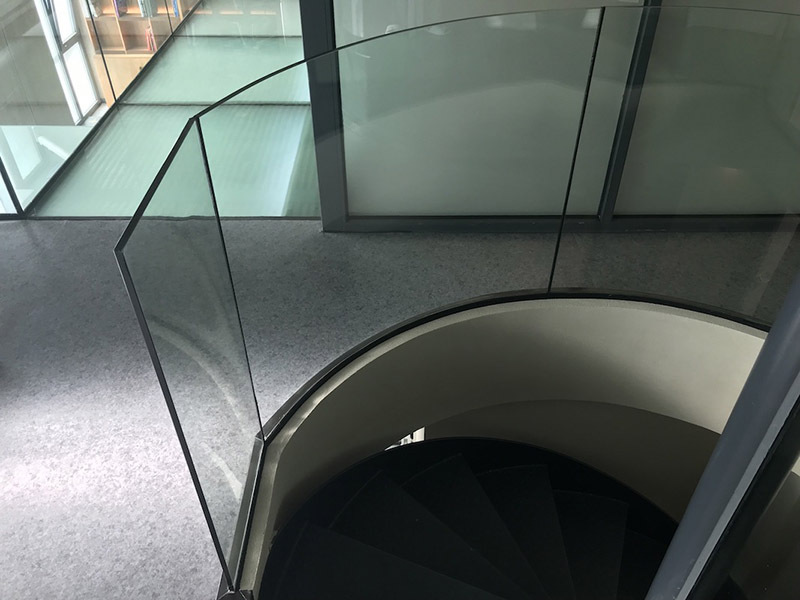 Among those linear elements of the space, this circular elements produces a sharp contrast; its handrail made from translucent, curvilinear glass planes also make contrast with the flat, linear glass planes of the Glass Corridor handrail. 17. 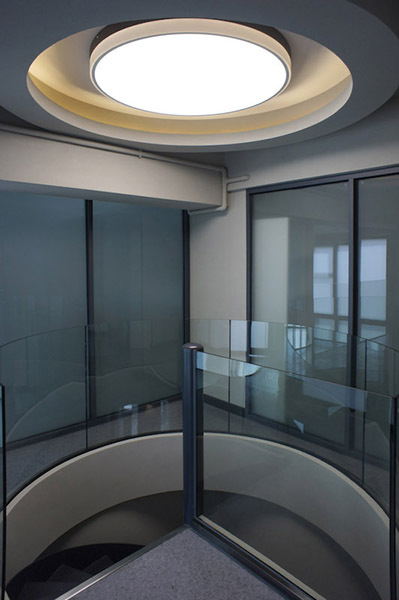 Round shaped ceiling light is provided right above the spiral staircase to make a "pair" by their shapes. This ceiling light combines direct light of the round lighting fixture and ceiling illumination around it. 18. Looking forward from the spiral staircase area to the Glass Corridor. This image strongly reveals this Glass Corridor as one of the main elements to integrate 3 blocks of housing units into a single space.